We are excited to share that Near.in has been acquired by Paytm. By joining Paytm, we will carry forward our mission to serve millions of service professionals and users alike. We thank you all for being a part of Near.in. We would be discontinuing our product in it’s current form and would launch a brand new offering within the Paytm umbrella. Feel free to connect us at info@near.in if this affects you in any form. Thank you again to everyone who has been part of this journey. As a user, wouldn’t it be awesome to be able to do the following things with the tap of a button? Buy the services of a birthday photographer for two hours,which culminates in a 100-photo album. The product e-commerce has created a consistent and seamless experience of buying anything, whether it is a book worth a hundred rupees, or an LED TV worth a lakh rupees. But such an experience is lacking when it comes to services. So where’s the ‘BUY’ button for services? A revolution of equal or bigger magnitude is waiting to happen in the world of hyper-local services. Marketplaces solving this problem today connect us to a bunch of service providers (from plumbers to pest control to photographers). However, once the connect has been made, the customer still has to go through a lot of trouble,defining what needs to be done, haggling for prices, and handling disagreements.Also, there is no recourse if the job was performed poorly, and so on. Clearly, this still leaves a lot to be desired, as far as customer experience is concerned. The focus should be on making things buyable in a consistent and seamless manner, not about connecting to merchants. To solve the real customer pain-points and ensure a smooth experience, one could look to sectors such as software, travel, and hotels, as examples. In all these sectors, the productization of services has brought in enormous value to end customers. It brings in the advantages of upfront pricing, comparison-shopping, marketplace competitiveness and one-click buying. Standardize the service: In order to standardize services, one needs to treat them like a SKU (Stock Keeping Unit). Currently in the industry, there is no standardization of rate cards and pricing units. And specifications of a service vary across merchants, for the same service. The user does not know how exactly the service is being priced, and the providers quote prices based on the paying capacity of the user. Standardizing services, and their prices, will deliver a truly transparent experience to the consumers. Market governed upfront pricing: Rather than enforcing strict prices on every service, let service providers govern their own prices. Just like hotel rooms or flights, services are a perishable inventory, so if a service provider wishes to offer their services at a lower price point at any time, they should be able to do that. Market dynamics will ensure competitive prices, just like they do in product e-commerce. Define quality parameters. The best analogy for this is the hotel industry,which has been able to standardize experiences through defining well-documented star rating parameters. Even though each room has a different ambience, a star rating roughly categorizes the experience a user might have. One needs to define a similar star rating for services, which will determine the quality of the vendor offering the service. Managing fulfillment: Product e-commerce would not exist at this scale if the people and organizations involved did not have a completely managed fulfillment experience. Ensuring that something will be delivered to the customer in the time promised, with a well defined return policy, makes the entire buying experience exceptional for the user.In case of services,customers should have same expectations from a marketplace. The marketplace needs to ensure that the customer’s experience is managed at each step; scheduling a time, handling cancellations, ensuring service providers meet the appointment, and guaranteeing quality of services would all need to be managed by the marketplace. Create a proposition for service providers: A marketplace needs to ensure that the interests of service providers are aligned with the success of the marketplace. Such a marketplace would need to guarantee transactions (not leads), and monetization would happen only once the providers generate actual money from the marketplace. 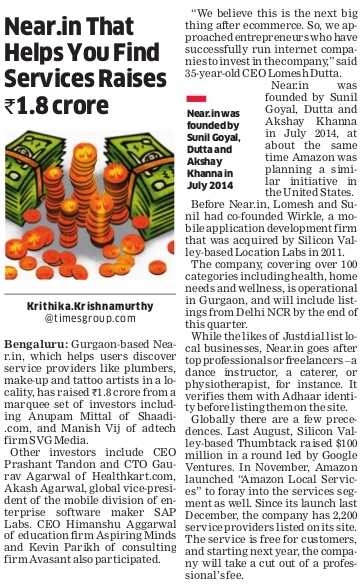 We are taking a stab at creating such a e-commerce marketplace for hyperlocal services. Checkout http://www.near.in and let us know what you think. Near re-imagines services ecommerce. Buy thousands of services, the way you buy products. – Honest and Upfront pricing: Get upfront transparent prices for every service. Backed by our Price Match Guarantee you can be sure that you always get the best price from service providers. – Peace of Mind Guarantee: We back every service purchased through our platform with our Peace of Mind Guarantee. If for any reason you are not satisfied with any service we will refund your money. From last few months as we have been working at Near, we have all been intrigued seeing exceptional women entrepreneurs doing wonderful job. Today as a small step – we would be there at MumsAtWork in Gurgaon to help support them be more successful. We are delighted to announce that Near.in has raised Rs1.8 Cr in funding. The round was led by Anupam Mittal – CEO People Group and Manish Vij. We started Near with a single aim to ease out the life for users like me and you to connect with great service providers. We thank our investors who believed in our vision and determination to go and fix the problem. Below is the press release as covered by Economic Times today. It was early July 2014, me, Lomesh and Akshay – 3 friends sitting in a local gurgaon college canteen debating around our own lives and India at large. All of us in the past decade had spent a considerable time both in India and US. And life has always been on a smooth and easy ride in US. In all our discussions, it was always a center point – life is “harder” is India, there’s “no quality”, “no trust” and it’s getting more “expensive” to live day by day. Having good degrees, we could not even help our wives – find a reliable and trusted person to get household work done? We said why not fix this problem once and for all. The first obvious stuff as an entrepreneur you face is “Validate the market?” Are we the only ones thinking about it! We met people from all walks of life – successful Entrepreneurs, our friends in VC firms, Merchants, Users at large. Everyone painted the picture in their own canvas. – Some did not see any problem. They were extremely happy the way the local yellow pages are solving the problem and lot better that even google could not match it. You want an APC UPS, ask for quote – you get 5 quotes and get one delivered at your home. – VCs saw the problem but they were caught in horizontal vs vertical debate. Verticals seemed to be more fundable. – Users if they needed a phone number or a product were very happy to use online yellow pages. But when we asked them how to find a dietician, yoga teacher, gym, physiotherapist – they had no clues. If they search for it they get 100 results, but didn’t know what to do with that list? – Our wives still had problem being able to get a carpenter or a good doctor and were always on social media asking their friends or peers if they knew anyone. And like them there were tens of these questions being asked on a daily basis on online forums. Digging deeper in today’s merchant centric world – completely changed our perception of how this industry is operating. – Merchants are paying in lakhs to rank higher in search results. In fact the entire concept of search results in some leading online yellow pages companies is Pay More, Rank Higher. In some categories tens of pages are filled with paid results. And you wonder if I am looking for a daycare for my kid will I even have a criteria who is paying more to the online service providers. There goes your relevancy and trust. – There were pseudo merchants who take leads and sell it to other merchants. – The long tail of good merchants got a free listing but did not rank anywhere and did not get any business. Apart from updating their facebook pages, they did not know what to do. With due respect to the online yellow pages companies, they work fine when we are looking for a phone number of a particular shop, nothing beats it. But, if I am looking for any service like say a birthday cake designer, a home caterer, a makeup artist, driver or physiotherapist, the entire model is done opposite of what should have been to offer a great service to an end user. – Good service providers who provide great and awesome service have a very hard way of getting themselves discovered. – Users who are badly craving for such providers have a hard timing finding them. What better could be, if we can build a company that can do this handshake? Need designer cakes – done by cake artists ? Want to get a portrait made for your 1 year old son? Need cooks at home for a party ? Near.in App for iPhone goes live! The iPhone App for Near.in is now available. – Go to near.in on your iPhone/iPad and we will prompt you to install the app. – Or Search for “near gurgaon” on App Store and you should get Near as the first mobile app. 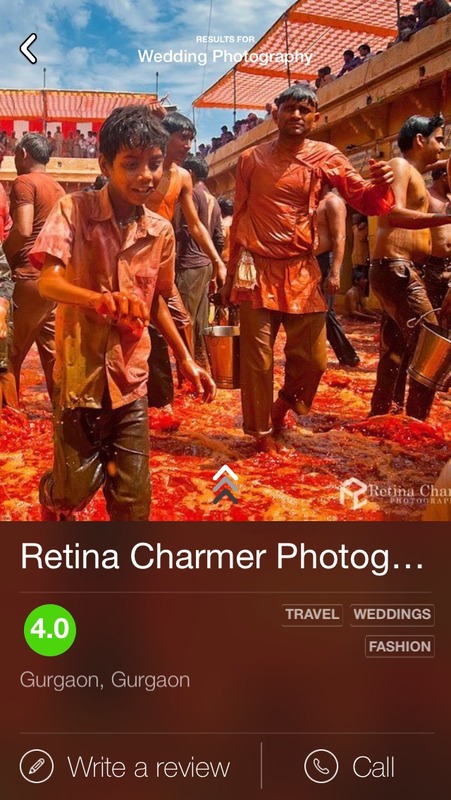 Retina Charmer Photography – Screen on iPhone App with Photographs, Reviews/Ratings, Pricing, Specialities and more ..
Home Screen – Search any service provider including Yoga Classes, Physiotherapist etc. 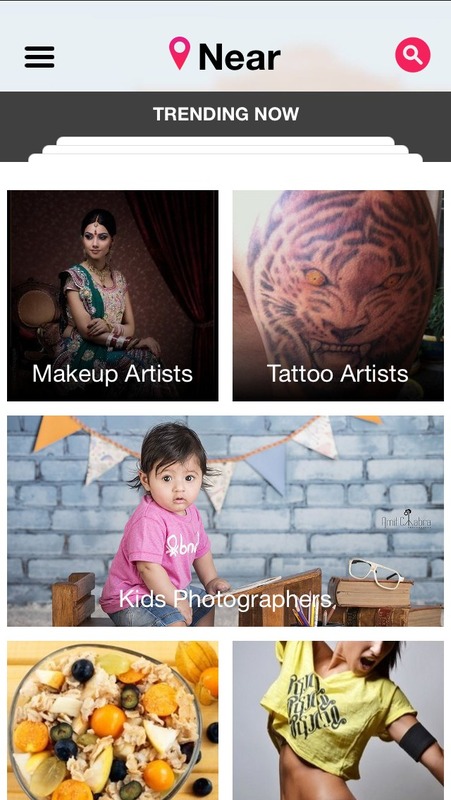 See Trending Categories – Makeup Artists, Tattoo Artists, Home Services – Electrician, Pest Control and more ..
We would love to hear your feedback. Please use our app and ping us back at feedback at near dot in. 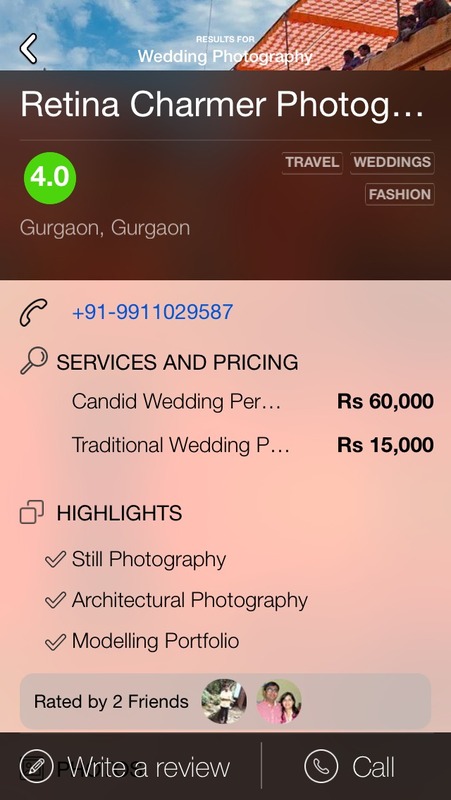 Near (near.in) iPhone App is your guide for finding top local service providers in Gurgaon. 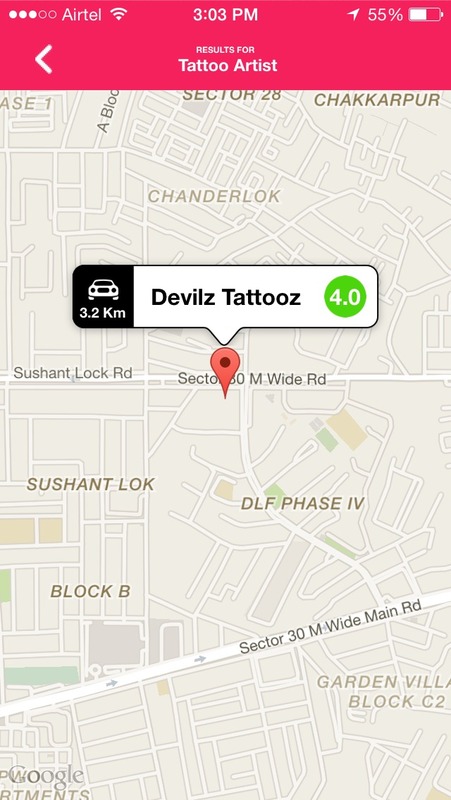 – Search for service providers near your location in Gurgaon. – Write reviews and tips of the businesses you like. – Nominate a service provider that you want to be added on Near! – See providers near you on a map and navigate to the business you like.